Archaeologists from a consortium of universities including UCL have found out what people ate while building Stonehenge, by analysing the food residues preserved in their pots as well as the animal bones and other food waste from the large settlement of Durrington Walls near Stonehenge. Pork and beef were the prime foods, barbecued and boiled. Chemical analysis by archaeologists at the University of York of food residues inside Neolithic pots has shown that boiled pork and beef were eaten in the houses while analysis of the animal bones by researchers at Sheffield University reveals that pork and beef were also barbecued in large, open-air feasts. Milk was also drunk or eaten - as curds-and-whey or cottage cheese - and its residues have been detected in pots from across the settlement. Pots with dairy residue also turned up more frequently than other foods in the ceremonial monuments, demonstrating that it was special, perhaps as a marker of social status or as a symbol of purity and ritual significance during public ceremonies. Unusually, there is very little evidence that people ate vegetables or cereals. Burnt remains of crab apples, berries, hazelnut shells and other wild fruits are all that survive of this 'meat fest' diet. There was no evidence that any of the pots had been used for cooking greens or other vegetables. Domestic animals were killed and eaten in huge numbers, particularly pigs. Detailed analysis of animal bones, conducted at the University of Sheffield, found that many pigs were killed before reaching their maximum weight. This is strong evidence of planned autumn and winter slaughtering and feasting-like consumption. This new research has given us a fantastic insight into the organisation of large-scale feasting among the people who built Stonehenge. The main methods of cooking meat are thought to be boiling and roasting in pots probably around indoor hearths, and larger barbeque-style roasting outdoors - the latter evidenced by distinctive burn patterns on animal bones. As complete skeletons of animals were found and traced to different parts of Britain, the team concluded that animals were brought as livestock to the site rather than as joints of meat. This is significant as it would require orchestration of a large number of volunteers likely drawn from far and wide. The observed patterns of feasting do not fit with a slave-based society where labour was forced and coerced, as some have suggested. Professor Mike Parker Pearson, UCL Institute of Archaeology and Director of the Feeding Stonehenge project, who also led the excavations at Durrington Walls, said: "This new research has given us a fantastic insight into the organisation of large-scale feasting among the people who built Stonehenge. Animals were brought from all over Britain to be barbecued and cooked in open-air mass gatherings and also to be eaten in more privately organized meals within the many houses at Durrington Walls. "The special placing of milk pots at the larger ceremonial buildings reveals that certain products had a ritual significance beyond that of nutrition alone. The sharing of food had religious as well as social connotations for promoting unity among Britain's scattered farming communities in prehistory. " 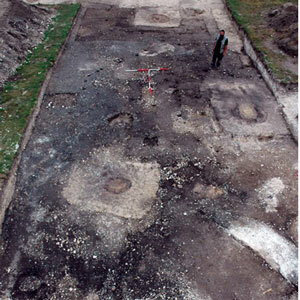 Dr Oliver Craig, Reader in Archaeological Science at the University of York and lead author on the paper, said: "Evidence of food-sharing and activity-zoning at Durrington Walls shows a greater degree of culinary organisation than was expected for this period of British prehistory. The inhabitants and many visitors to this site possessed a shared understanding of how foods should be prepared, consumed and disposed. This, together with evidence of feasting, suggests Durrington Walls was a well-organised working community." The Feeding Stonehenge project was funded by the Arts and Humanities Research Council (AHRC). The research paper is published in Antiquity.